This study investigates the microstructural evolution and phase transformation of laser-cladded AISI 420 martensitic stainless steel. The microstructural morphologies of the laser-cladded sample were examined using optical microscopy, scanning electron microscopy, and transmission electron microscopy (TEM) equipped with energy-dispersive spectroscopy. The three regions of bead zone, dilution zone, and an interface were investigated. The TEM study revealed various morphologies of martensitic phase in each region. The bead zone consisted of plate and lenticular martensite with internal twins, while lath and thin plate martensite and internal twins were presented in the dilution zone. Large lath martensite was observed in the interface zone the boundary between the dilution and heat-affected zones. The selected area electron diffraction identified those forms of martensite as the ά-martensite in three zones. Other microstructural features such as nano-carbide precipitates and high density of dislocations were also observed in each zone. The martensitic transformation with various morphologies provided crucial information about the development of residual stress throughout the three zones. It was concluded that due to the high cooling rate, the martensitic phase transformation first occurred in the bead zone with the formation of plate-like martensite. Combination of the plate and lath-like martensite formed subsequently in the dilution zone created high compressive stress in this zone and high tensile stress in the bead zone. Manuscript submitted January 11, 2018. This research is partially funded by the Natural Sciences and Engineering Research Council of Canada through the Discovery Grant. 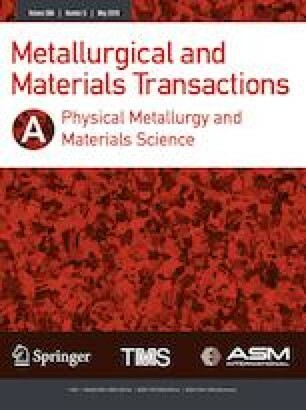 The authors would like to thank the laser cladding industry sponsor for the materials and experimental support it has provided for this research project. The authors acknowledge Professor Derek O. Northwood for reading the manuscript and providing his valuable comments. The authors also acknowledge Dr. Navid Nazemi (CAManufacturing Solutions Inc), Dr. Travis Casagrande, and Dr. Carmen Andrei (Canadian Centre for Electron Microscopy) for their help in providing simulation data, FIB and TEM imaging respectively. A. Keyhani and R. Roumina: arXiv:1711.01556, 2017, pp. 1–20.